This listing includes the original game CD. The box is pictured for reference only and is not included. 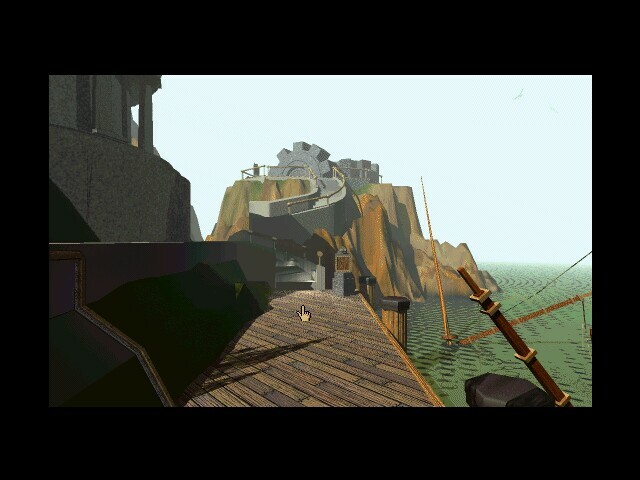 Myst was one of the most popular games ever released on both IBM and Mac platforms. It was the first to incorporate full multimedia and one of the first to be distributed only on CD. Myst. Myst. The name whispers of fog and obscurity, of mysteries not yet understood. It intrigues and draws one to the box, which contains a number of detailled screen shots. 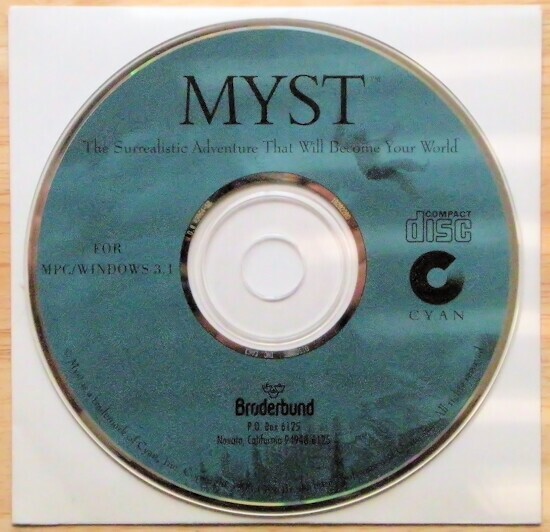 Myst was my first extended contact with CD-ROMs and MPC along with hundreds of thousands of other players. After installation I started the game. And that was the last time I considered Myst a mere game. As the credits roll, a voice talks about losing a book, and a book falls through space. It lands open and with the questions ringing in your ears - the sound is extremely evocative - you see a picture on a page. The picture moves...and as you handle it the picture expands to bring into the scene itself. 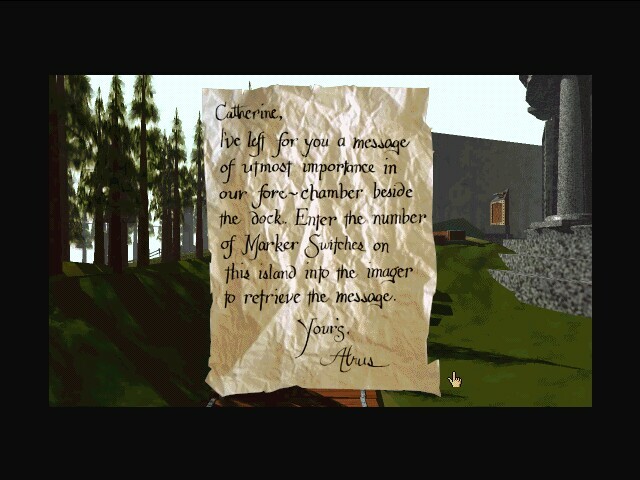 Myst was the first game to take multimedia to the limits of the time. A dock, with the wind hissing above you, the water splashing irregularly, a bird (or is it a small dragon?) flying in the distance. Before you lies an electrical-looking switch, of all things; A sunken sailing ship is in the water, there is an odd hill before you with gears on the top, and a forest nearby, with some buildings between. As you move about - simply clicking the mouse in an area and watching the dissolve to a new scene - the sounds become appropriate to the new surrounding, while the views show your new location. Some things can be examined closely, but only if they are of interest. This may seem like a giveaway, but it is not. What is the obvious signifigance of a perfect model of the sunken ship, placed in a bird bath halfway across the island? Sure, it must be important - you can look at it! But that does not give away a whit of information, and it is this ability to both simplify and obscure which gives the world it's strongest illusions. Everywhere I went, I felt that I was there. Beautifully detailed furnishings lush decor, and strangely disturbing buildings. Devices stand ready, with no apparent instructions. And yet a little thought and some logic reveals the purpose of many things, while the occasional written clue helps you along. You feel very alone, and at times, even scared, as if you were there, and did not know which way to turn next, or what results your actions would produce. I have had games make me nervous before - will I kill the wizard this time, or he me? - but I have never had a game affect me like, say, a Lovecraft story, where the slow accumulation of details leaves me as nervous as the characters after a time. Myst can do this to me. Myst has a plot, but not a linear one. Any problem can be attacked in any order, with the caveat that most of the problems in a world must be solved to find the way back to the island. (There are several different worlds to visit, besides the island). Of course, it can be hard to tell which things relate to other things, but that is part of the attraction. And the plot is not fully obvious, even as it advances. Yet another way for Myst to shine. Myst created a new world in which to escape. It was and is a truly unique game. Bear in mind that it can sometimes have a slow pace, and you won't go wrong. Just relax, and enjoy the visit. It is all too soon over.